Acute aortic dissection (AAD) is a disease of relatively low incidence but very high mortality. Its presenting symptoms and signs are highly variable and frequently overlap with other less critical etiologies. The majority of patients expire prior to presentation to the Emergency Department. However, an even further complication is that nearly one-third of patients with AAD are misdiagnosed on initial evaluation. Standard imaging modalities for diagnosis of dissection include trans-esophageal echocardiography, CM and magnetic resonance imaging. All of these are expensive, time consuming and may not be readily available in a point of care setting. We present a case of an extensive AAD identified in a young patient with abdominal pain and neurological deficits. Point of care ultrasound allowed the identification of an intimal flap in multiple locations and resulted in rapid diagnosis and treatment. The incidence of aortic dissection ranges from 5 to 30 cases per million people per year, with the majority of patients dying before presentation to a hospital . Additionally, the clinical presentation of aortic dissection can be confusing as it may mimic myocardial infarction, stroke or other life-threatening conditions. Consequently, several studies have shown that the diagnosis of aortic dissection has been missed in up to 38% of patients on initial evaluation [2–4]. Because any delay in diagnosis can lead to a higher morbidity and mortality, it is critical to keep a high clinical index of suspicion in establishing the diagnosis of aortic dissection. Physical examination for either confirming or ruling out aortic dissection is unreliable. Radiologic imaging, however, is highly sensitive and specific with computerized tomography (CT), magnetic resonance imaging (MRI), trans-esophageal echocardiography (TEE), and angiography being the most sensitive . In contrast, transthoracic echocardiography (TTE) has a sensitivity and specificity ranging from 35 to 80 and 39–96%, respectively, depending on the anatomic location of the dissection [5–8]. Yet, as more clinicians begin to use sonography at bedside, the characteristic signs of dissection, floating intimal membranes, the enlargement of the aortic root or arch, and an increase in the aortic wall thickness are occasionally encountered while the clinician is evaluating for other conditions . 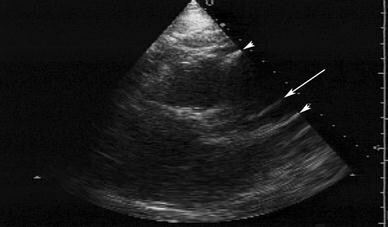 We report of a case of aortic dissection diagnosed by expeditiously using bedside ultrasound. A 47-year-old male presented to the emergency department approximately 45 min after smoking crack cocaine complaining of excruciating abdominal pain and no motor or sensation below the level of the umbilicus. The patient had a history of hypertension and coronary bypass graft surgery 4 years earlier. The patient was found to be hypertensive and tachycardic. Physical examination revealed acute lower extremity paraplegia, with no palpable femoral pulses bilaterally. During his evaluation a bedside ultrasound was performed of his abdominal aorta as well transthoracic 2D echocardiography. 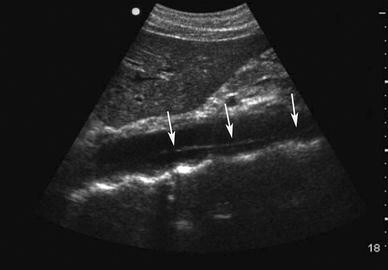 Abdominal sonography did not reveal an aneurysm of abdominal aorta, which measured 1.85–2.14 cm in transverse diameter. However, a floating intimal membrane was visualized consistent with aortic dissection, Fig. 1. Transthoracic echo demonstrated dilated aortic root of 5.1 cm, and a flap in the proximal ascending aorta, with no evidence of aortic insufficiency, Fig. 2. In addition spectral analysis of common femoral arteries was performed bilaterally and defects were noted bilaterally. Acute aortic dissection (AAD) can be rapidly fatal with out early diagnosis and appropriate medical, surgical, or endovascular treatment. In fact, the mortality rate of aortic dissection approaches 1% per hour during the first 48 h . If unrecognized and untreated, aortic dissection results in a 90% mortality with in the first 3 months, usually due to acute aortic insufficiency, major branch vessel occlusion, or rupture into the pericardium, mediastinum, or left hemithorax . Computerized tomography, TEE, and MRI are the most commonly used modalities to diagnose AAD. The detection of an aortic dissection by CT has a sensitivity from 93 to 100% and a specificity of 87–100% with the primary diagnostic criterion being the detection of an intimal flap separating two contrast-filled lumens . However, CT examination for AAD requires contrast, transportation from a monitored environment, and patient cooperation for an adequate examination. Angiography is the most widely used modality and is preferred by surgeons prior to repair. Angiography can demonstrate the extent of the dissection, differentiate the true and false lumen, identify the entry and re-entry sites by detecting intimal tears, demonstrate the anatomy of the major arterial branches, and determining aortic regurgitation. However, angiography is an invasive procedure which is associated with morbidity, mortality, requires time for setup and performance which can be difficult in critically ill patients, and when the false lumen is totally thrombosed, the diagnosis may be obscured . Magnetic resonance imaging and TEE offer modestly improved sensitivities for the detection of AAD, i.e. 95–100 and 95–98%, respectively . However, these modalities are difficult to perform on the patient with AAD due to the immense pain associated with this condition. Additionally, more than one-third of patients with AAD will demonstrate signs and symptoms secondary to organ system involvement. These secondary manifestations may include acute aortic regurgitation with resultant cardiac decompensation and shock, cerebral ischemia or stroke with resultant alteration in mental status, spinal cord involvement with resultant infarction and para or quadriplegia making MRI or TEE impossible to perform emergently. To complicate matters further, these diagnostic modalities are difficult to obtain in most centers 24 h a day . Transthoracic echocardiography has been used to diagnose AAD and is often the initial screening tool in unstable patients. In spite of the drastically lower sensitivity of TTE (35–80%) [5–8] as compared to that of CT, MRI, or TEE, TTE has the advantage of being able to exclude other differential diagnoses in critically ill patients. Often, TTE is being performed to rule in or out these other diagnoses such as myocardial infarction when a dissection is discovered. Therefore, the clinician must keep a high index of suspicion for AAD when performing ultrasound involving any of the vasculature such as looking for an intimal flap on an abdominal aorta exam or a dilated aortic root on a cardiac exam. As in this case, an abdominal aortic ultrasound using a curvilinear probe revealed the hallmark of AAD, an intimal flap. The discovered dissection was then traced origin of the aorta using a phased array probe utilizing both the standard TTE views and the suprasternal notch as a window to the superior portions of the aortic arch. With the use of multiple image planes including unusual imaging windows such as the right parasternal, left parasternal, and paraspinal, the thoracic aorta can be imaged in its entirety increasing the accuracy of TTE . Though aortic dissection can be reliably detected by a variety of imaging modalities, often critically ill patients are unable to tolerate out of the emergency department procedures. Though TTE and aortic ultrasound are lower in sensitivity and specificity, TTE can be a noninvasive bedside procedure that is useful in diagnosing AAD. Though not a frequent finding on abdominal ultrasound evaluation, visualization of an intimal flap (especially in multiple views) can indicate AAD.